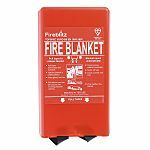 Fire blankets are a small and cost effective fire extinguishing device. Fire safety is one of the most important topics of discussion in health and safety. To comply with current regulations, all fire equipment must be properly installed, tested and maintained. Fire Extinguishers and hoses are often looked at as the main safety equipment in these situations, but fire blankets are severely overlooked in their importance. 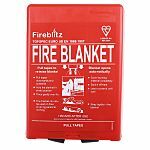 A good quality fire blanket should be easily accessed and used, ensuring a small domestic or workplace fire, does not turn into a life-threatening situation. For domestic and light industrial use, including home and work based kitchens.